Jordan, as a modern, moderate Muslim Arab country, has achieved remarkable successes in many fields, including education, health, infrastructure, information technology, industry and tourism. Short of natural resources, Jordan has focused on the strength of its human capital. The enormous challenges that Jordan faces have not deterred it from continued structural reforms and the modernization of its health and education sectors, as well as continuing to be the single major contributor to the Arab information technology revolution. More than 75 per cent of the Arab world’s contributions to the internet have been Jordanian, which serves to showcase what a highly educated, tech-savvy workforce the country has. Jordan is a centre of excellence in health, education and IT in the Middle East and North Africa region, placing it at the heart of the Fourth Industrial Revolution. While Jordan is a small country situated in the middle of a dangerous neighbourhood, it continues to choose bridges over borders, acceptance and inclusion over rejection and exclusion, values that are part and parcel of the makeup of the Jordanian identity and character. These values have been honed and tested by shock and by one crisis after another. Jordan often plays a vital, sometimes critical, role as a beacon of peace, hope and reason in a very complicated and turbulent region of the world. 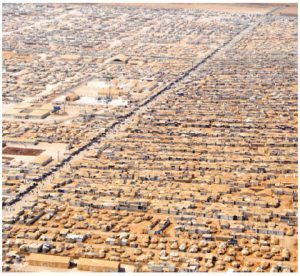 For the past eight years, the Syrian crisis has continued to drag on and Jordan has served as host to the second-largest number of refugees per capita in the world. 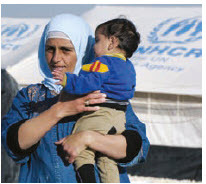 Between 2011 and 2018, we’ve received 1.3 million Syrian refugees, which has cost more than US$14.7 billion. Our people have opened their hearts, homes, hospitals, schools and public services and shared our country’s scarce natural resources, most notably, the vital food-water-energy nexus, on behalf of the international community and in full accord with our country’s long-standing humanitarian traditions. How the world responds to the global crisis of the plight of refugees will determine the future of our world. Stronger recognition and international collaboration are the key if we are to succeed in this endeavour. Taking into consideration the fact that children make up more than half of the refugee population in the world, it’s imperative to overcome the crisis they have endured, in order to unlock the potential they hold for the collective future of humanity. While upholding its longstanding, principled position of an open border policy towards people fleeing the horrors of war, Jordan has been dealt a tough hand, given the massive numbers of refugees arriving on our doorstep, particularly over the past eight years. The Jordanian economy has also taken a hit. Jordan, in collaboration with bilateral and multilateral partners, amongst which Canada has been playing a leading role, is undertaking concerted efforts to present its economic narrative of the country’s transition to become a more productive, competitive and export-led economy. Jordan is moving towards generating growth by attracting investments and increasing exports, thanks to strong international support for its economic transformation and resilience in the face of major economic challenges, including, but not limited to, the influx of Syrian refugees, and the cutoff of significant trade routes due to the closing of borders with Iraq and Syria. Despite these socio-economic pressures and more, the government of Jordan has managed to cut its deficit and has stabilized its public debt levels through the implementation of massive fiscal adjustments. Jordan continues to articulate the true social essence of Islam, a religion based on the pillars of tolerance, compassion, mercy and respect for the dignity of all mankind. We address bigotry and hate through interfaith dialogue, and uphold the principles of coexistence and mutual respect amongst all people of the world. Jordan has always been a champion for peaceful conflict resolution, which is why we strongly believe that the long denial of justice and statehood for the Palestinian people is the most destabilizing factor for our region. This issue has far-reaching global ramifications. The Palestinian-Israeli conflict has been a critical disruptor of global peace and security. Efforts for peace in the Middle East continue to end in injustice, occupation and violence. The fact that it’s been more than eight decades not only points at the failure of the concerned parties, but also amplifies the failure of international norms and values. The answer to the Palestinian-Israeli conflict is a durable two-state solution, one that meets the needs of both parties and one that is in full conformity with international law and United Nations resolutions. It should give the Palestinian people — the only people under occupation in the 21st Century — a viable, independent, sovereign Palestinian state with East Jerusalem as its capital. It should also ensure peace, security and full regional integration for Israel. Anything unilateral that results in unequal rights or less than a lasting peace will be a moral disaster that serves only to ensure the continuation of this conflict. Jordan has been vocal in calling for an end to global terror and extremism, and has flagged the urgent need for a collective holistic approach. That’s what we need if we are to defeat this evil that continues to target all countries of the world. Our response must address the security, military and ideological aspects of this peril. It must address the global threat, but also counter the radical narrative through adhering to moderation and inclusion, providing all people, especially the youth, with hope and a stake in the endless possibilities and promises of our times. Rima Alaadeen is Jordan’s ambassador to Canada. Rima Alaadeen is the ambassador of Jordan. Email her at ottawa@fm.gov.jo or phone her at (613) 238-8090.